Neethodu Project team and CSN Rural team jointly organized an Awareness Rally and a meeting to mark the WORLD AIDS DAY “RIGHT TO HEALTH” on 1st December 2017 at Poranki in association with Anumolu Charitable Trust. Poranki Village President Mrs. Vemuri Swarupa Rani, Vice president Mr. Anumolu Prabhakar Rao, ZPTC member Mr. Boggavarapu Srinivas, MPP Mrs. Borra Kanaka Durga, TDP Leader Mr. Manchineni Paramesh, Penamaluru PHC Dr. Subbarao, Dr. Yesuraju were the guests for the event and nearly 150 members including PHC Doctors, ANMs, ASHA workers, local public and Neethodu beneficiaries and school students attended this rally and meeting. 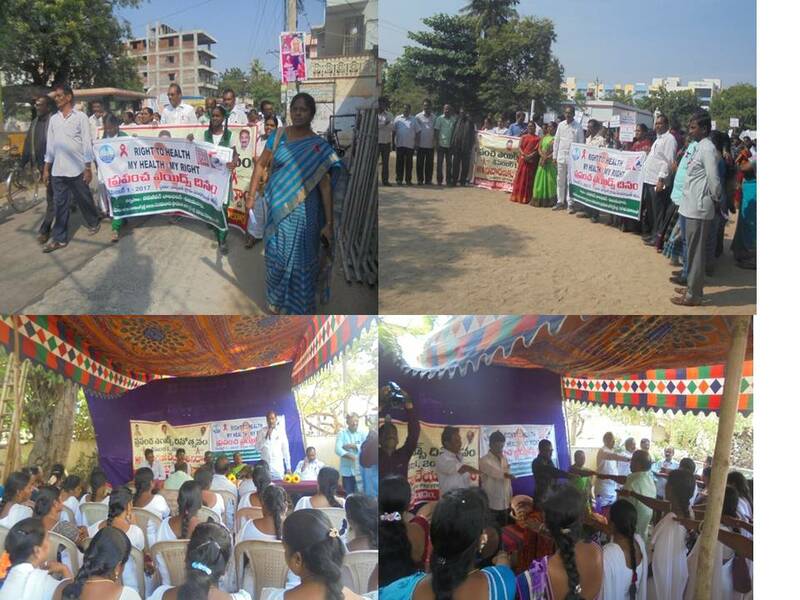 Program Manager Mr. Malleswara Rao started the event by invited all the guests and participants and then the rally was started from ZP HIGH School Poranki with a meaning full songs sung y Mrs. Sheeba and Mrs. Swarna and imposing Slogans on AIDS to make the people aware. The rally covering the main junctions of the village ended at Poranki Panchayath office. After finishing the rally, small awareness meeting was held at Poranki Panchayath office starting with Mr. Malleswara Rao NJBB explaining about the Neethodu Project and its services in 40 slums of Vijayawada urban and 10 villages in Penamluru mandal. He mentioned that 150 families with HIV have been identified and Navajeevan is providing education and Nutrition support to these families. Neethodu volunteers and field staff regularly go for home visits and monitor the families and their health conditions. Then he explained about skill training programmes in Navajeevan Bala Vikasa Kendram and the trades available for the youth empowerment. In continuation to this Dr. Yesuraju Penamaluru PHC explained how a person gets infected by HIV and what precautions one should take. He also explained about the disease and said that prevention is better than cure. He said that everyone should respect and honor the person with HIV and show no discrimination towards them. Infected person should take Nutritious food and maintain hygiene. There are preventive medicines available that stop the infection spreading to child from mother which makes possible No HIV child in future. He asked the infected people to regularly use the free medicine by the Govt. On this occasion Mr. Anumolu Prabhakar village vice president said that it is not important how a child or family got infected but how we can save a child and family is important. He praised Navajeevan for extending great services in providing Nutrition and Educational support. He mentioned that NJBB team is not only monitoring the families but also counseling them, helping the families within health checkups and medicines with the support of Govt. and Private hospitals. At the end he expressed his happiness that such awareness is organized in Penamaluru mandal. The awareness meeting came to an end with distribution of snacks to more than 200 participants and guests and delivering vote of thanks by Programme manager Mr. Malleswara Rao.